A major exhibition that considers the questions of why and how black has become part of our identity as New Zealanders will pop-up in the Auckland Britomart precinct from 9 September to 24 October 2011. The exhibition, Black in Fashion: Wearing the Colour Black in New Zealand, has been designed and realised by the New Zealand Fashion Museum, with Doris de Pont as curator. Timed to coincide with the Rugby World Cup, the exhibition is part of the Real NZ 2011 Festival. The exhibition breaks new ground as it is the first time the topic of “the wearing of black as part of our identity” has been explored in a museum exhibition. While there is not a single event or specific date which marks New Zealand adopting the colour black as our own, the exhibition builds a picture whereby the viewer gets a sense of the evolution of a black New Zealand identity. Black in Fashion incorporates a diverse array of garments and objects which are organised across a number of themes including: black in early New Zealand, black in sport, in music, in film, black in authority, black against authority, black from a Maori perspective, black in a rural view, and black in fashion. The garments on display span a 120 year period and highlight not just how fashion has changed, but also how immigration and our changing relationship with the rest of the world has impacted on our sense of self and how that manifests itself in a developing New Zealand identity. A black Victorian dress dated from circa 1890, while made here, highlights New Zealand’s strong historical ties with Britain and our relationship to the dress codes and mores of Mother England. 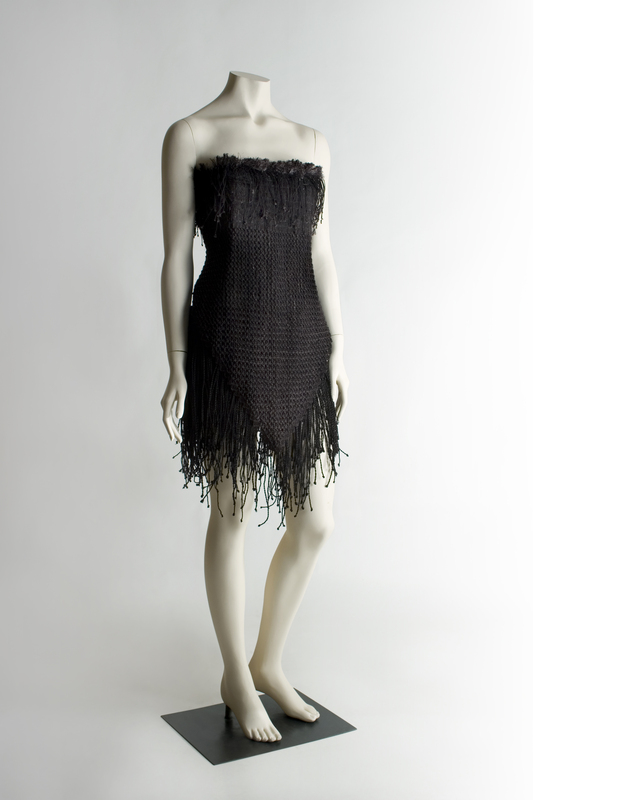 Another dress woven from harekeke and lurex threads for the Style Pasifika competition in 2007 gives a distinctly contemporary Maori twist to that fashion perennial, the little black dress. The ‘newest black’ is represented by a selection of garments from recent New Zealand fashion design graduates, who claim various ancestry such as Chinese and Palestinian, highlighting our growing ethnic diversity and an evolving fashion aesthetic. Irene van Dijk’s Silver Fern uniform from the Commonwealth Games Delhi 2010 where New Zealand took Gold by defeating Australia 66-64 in extra time. The TOA Aotearoa gang patched leather jacket, vest, belt and pants made for Taka (Gang Leader), played by Calvin Tutaeo in the New Zealand film Once Were Warriors. White Tie Formal attire of Sir Keith Holyoake, the third longest serving New Zealand Prime Minister (1957, 1960-1972) and also Governor General (1977-1980). A daring gown by Konstantina Moutos, which won a Benson and Hedges Supreme Award in 1986, which was flown back from Greece to be part of the exhibition. Opening hours are 10am-6pm Monday to Saturday and Sunday from 10am-4pm. Entry to the exhibition is free and a series of floor talks will be hosted throughout the exhibition. Black in Fashion will be housed in a new retail space designed by Cheshire Architects at the Britomart Precinct. To find out more visit www.fashionmuseum.org.nz.